Assure. Ensure. Insure. Do you use these similar-sounding verbs correctly? Many people don’t. For example, I phoned a large, well-regarded organization and heard this announcement: “In order to assure excellent customer service, your call may be monitored.” Assure was the wrong word; the greeting should have used ensure. People sometimes use insure incorrectly, too. To insure means to protect against financial loss. People insure their cars, homes, and art collections. In the 1940s, Betty Grable’s movie studio insured the star’s “million dollar legs” with Lloyd’s of London. To assure means to promise. Assure is a transitive verb, so it requires an object—and a personal object, at that. We assure a person: “I can assure you.” (You is the object of assure.) The journalist Nelly Bly said, “The more I endeavored to assure them of my sanity, the more they doubted it.” (In this example, them is the object of assure.) 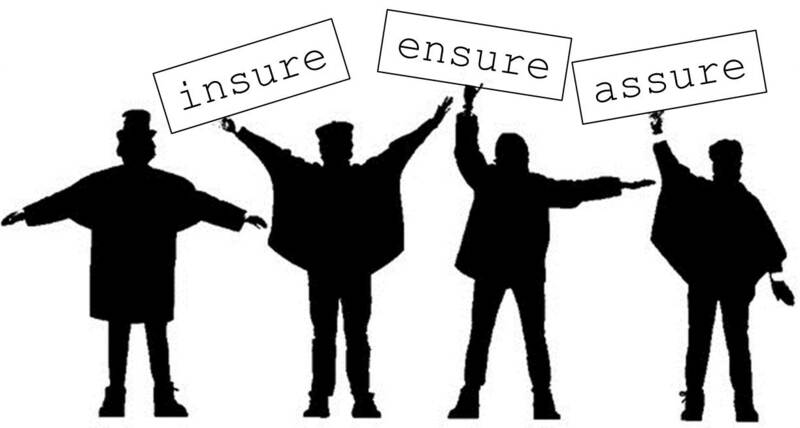 If you write assure and notice that it has no object, change it: use ensure instead.